Completed in 1898, the original chapel and parsonage were demolished in 1905.
in the gemstone floor plan, perfect for the unusual footprint of the five-point intersection. Also featuring a Brothers O’Dell organ, extensive original woodwork, scagliola columns, hand-painted murals, and a magnificent suite of leaded and stained glass windows and domes, the Calvary Church is home to the two largest signed Tiffany window ensembles in Philadelphia. ​By 1994, the once grand Calvary building’s future couldn’t have looked more bleak. It shared the dishonor of being ranked by Philadelphia architects among the top ten endangered Delaware Valley landmarks in the Philadelphia Almanac. Radical change in the neighborhood’s demographics depleted original membership in all West Philadelphia churches. With its declining membership, Calvary deferred maintenance projects for far too long. Having never undergone a major renovation since its construction, Calvary now required major expenditures to return the building to a safe, functioning resource for the community. In 1994, responding to the daunting costs and inability to sell the building in its current state, the Methodist congregation reluctantly put the building and its priceless stained glass windows up for sale. 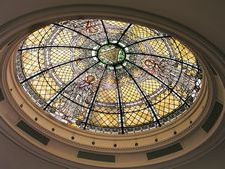 Philadelphia almost lost this magnificent stained glass dome, which crowns the theater/chapel. ​As the two magnificent stained glass domes were being dismantled for shipping, community members formed a coalition to find a way to keep the doors open. Reflecting on the Church’s tradition as a beacon for community work for peace and justice as well as cutting-edge religious philosophy, these dedicated community members, along with members of the Church, founded the Calvary Center for Culture and Community (CCCC). In 2000, after several years of hard work and several “close calls,” CCCC was incorporated as a 501(c)(3)organization. Its mission, to restore the building and redevelop it as a center for cultural and community activity. Supported entirely by community volunteers, including architects, educators, arts and financial administrators, local universities and religious leaders, the “community hub” at Calvary has grown beyond all expectations and become the unofficial town hall of University City. 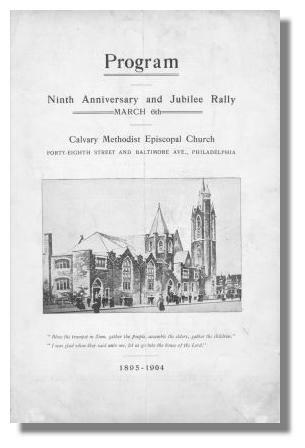 ​Over one hundred years ago, the Philadelphia Methodist Episcopal Bishop ordered the creation of a church to stand as a beacon for worship and hope for the West Philadelphia community. Even today, the Calvary Church’s English Gothic revival stone façade, most clearly distinguished by its multi-turreted tower, remains the tallest structure on the Baltimore Avenue.